A genuine smile brings joy! ENERABLE LAMA LOSANG SAMTEN has been sharing teachings of loving-kindness, joy and compassion, as well as the path to enlightenment for almost 30 years. Losang lived and studied over 20 years in the Namgyal Monastery (the monastery of His Holiness the Dalai Lama) earning the highest degree attainable at the monastery, equivalent to a doctoral degree in the West. He also became a Master of Ritual Dance and Sand Mandalas and was the Personal Attendant to His Holiness the XIV Dalai Lama prior to moving to the United States in 1988. Ven. Losang Samten is one of the Mandala Masters who created the first public sand mandala in the West in 1988. He is the spiritual director of several Buddhist Centers in North America, with a home base currently in Philadelphia, Pennsylvania – the City of Brotherly Love. Ven. Losang Samten has led an illustrious career creating sacred sand mandalas that follow the ancient Buddhist tradition. These have been created in museums, universities, schools, community centers, and galleries throughout the USA, Canada, Mexico, and Europe. Losang has received the National Heritage Fellowship from the National Endowment for the Arts, a PEW Fellowship, and two honorary doctoral degrees from Trinity College in Hartford, Connecticut, and the Maine College of Art. Losang played the role of the attendant to the young Dalai Lama in Martin Scorsese's film Kundun, where he also served as the religious technical advisor and sand mandala supervisor. 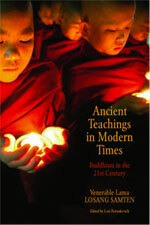 Losang has written two books, one in Tibetan on the history of the Monastery of His Holiness the Dalai Lama and one in English, Ancient Teachings in Modern Times: Buddhism in the 21st Century. Losang embodies the qualities of loving-kindness, patience, and joy, which have touched the hearts of all those whom he meets. When I first sat down to write I was only planning to draft a few pages to share at retreats in the United States and Canada. I am amazed that this simple idea developed into this lovely book that offers the essence of the teachings of the Buddha relevant to everyday life in the 21st century. Writing this book is a wonderful opportunity to share what I have learned from growing up in a Buddhist family, studying for 20 years in a monastery, and living for over 20 years and teaching in the West. Go here for more information and to buy this book. To follow Losang's travels and to see photos of his work, like him on his Facebook page.